There is no better way to enjoy the mesmerizing view of Tokyo than from the sky! Fly over some of the most symbolic landscapes in Tokyo including the Rainbow Bridge, Hamarikyu Onshi-teien Garden, Tokyo Tower, Tsukiji Market, The Imperial Palace, Tokyo Station, The Sumida River, Ryogoku Kokugikan, Asakusa Kaminari-mon, Tokyo Skytree, the Arakawa River, Kasai Rinkai Koen Park, and more. After finishing the orientation (approx. 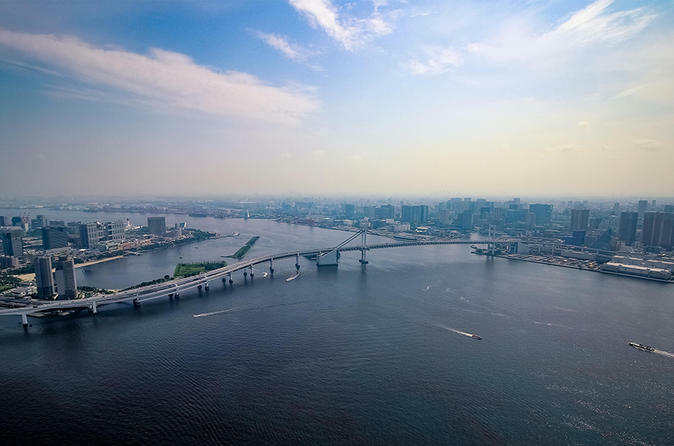 30 mins), get ready to take off from Tokyo Heliport and fly over some of the most symbolic landscapes in Tokyo including Rainbow Bridge, Odaiba, Hamarikyu Onshi-teien, Tokyo Tower, Tsukiji Market, The Imperial Palace, Tokyo Station, The Sumida River, Ryogoku Kokugikan, Kaminari-mon, Tokyo Skytree, The Arakawa River, Kasai Rinkai Koen, and more. The helicopter ride will be approx. 10 mins and the beautiful view of Tokyo will make it the most unforgettable moments for your trip!